CITRUS HEIGHTS, CA (MPG) - The streets of Citrus Heights once again lit up with the sights and sounds of a strategically executed caravan of 27 police vehicles as they wound through three neighborhoods to deliver toys, stuffed animals, bikes, beds, blankets, food, and other gifts to two waiting families and the children of Sayonara Drive. Nearly fifty Citrus Heights Police Department (CHPD) police officers, staff and volunteers, along with Mayor Jeannie Bruins, city council members, Santa Claus and others, arrived at a home on Sperry Drive and an apartment complex at Antelope and Auburn with lights flashing and sirens blaring. At both locations children and their families suddenly appeared from nowhere and the fun began. The second single mother to three children has been working long hours at a difficult job to move her family into their own apartment. Seeing her family happy and well cared for has made it all worthwhile. 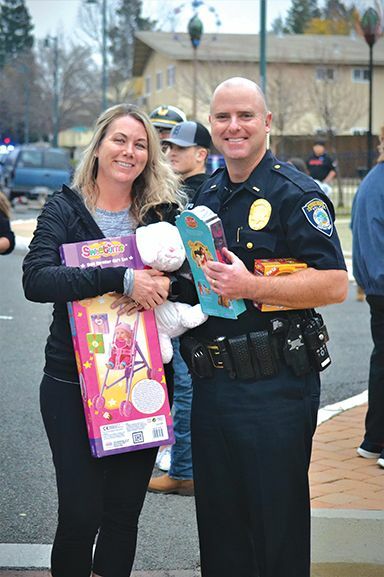 Families chosen to receive the special holiday delivery were selected from community referrals to the city’s Holiday Referral Program overseen by the police department. Items are donated by members of the police department, non-profit service and faith organizations, schools, private businesses and individuals. Also adding a personal touch were homemade Christmas stockings, filled and donated by the Soroptimist. In addition, adult patients in the Multiple Sclerosis Day Wellness program under the umbrella of Dignity Health crocheted full sized blankets to help bless recipients. The Rotary Club of Citrus Heights provided food boxes for families.